“And don’t forget the Irish threat in those days,” Tristam added on the side. “So, will they find one to pull out the sword of the Roman?” Gwyr asked. “But isn’t that always the case?” Gerraint asked. The boys looked at each other in silence for all of a second before they ran to the courtyard of the sword in the stone. The next hour got spent tugging on the sword, though Gerraint and Arthur only stood back and laughed. Urien said he wiggled it and Arawn supported him. Gwillim said he also wiggled it, but his brother Thomas laughed and denied it. It did not take long before the game became two sides playing at war, but with sticks instead of swords. Arthur’s group always won because Thomas was not much of a leader. Gerraint avoided the game at first because he wanted to check something out. Gerraint snuck out to the alley beside the church where they had a garbage dump and several perpetually brown bushes. It looked sheltered and secluded enough for him to try something. He called softly, “Hunters,” but nothing happened and no hunters appeared. So he thought hard about his experience on the road. He grabbed what he imagined was a name. “Lord Pinewood,” he whispered, but the alley remained empty. Finally, he put some command in his voice, though he still tried to keep the volume down so as to not attract attention. “Pinewood.” He got ready to give up when the elderly hunter appeared from behind a bush in the alley. “I’ve been thinking,” Gerraint started right in, and stopped. “And a good thing for a young man to do,” Pinewood encouraged, and his grin became a smile. “A dark elf and a dwarf,” Pinewood said, and Gerraint knew he spoke true, even as Pinewood said it. Pinewood smiled again. “I guessed, you know,” he said, and became fairy small, with wings and everything, and flitted rapidly out of sight. Gerraint headed back inside, but ran smack into Meryddin who rushed around the corner with two men following. “They usually don’t come so close to a church,” one of the men responded; but then Gerraint felt it best to run so he did not hear any more. All of the Lords, which is to say, chiefs of the many tribes and nations of the Gaelic peoples of Britain, Wales and Cornwall gathered in the courtyard of the stone first thing in the morning, along with the young Lords, and the squires, who were pushed back to the outside edges where they could barely see anything over the heads of their fathers. The older ones knew the basic story. 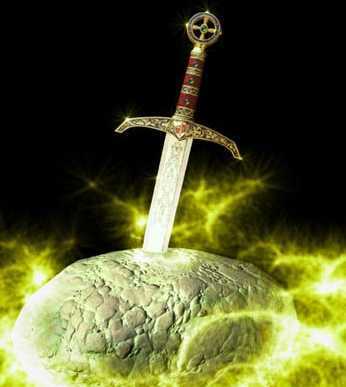 Peredur said that anyone who was alive when the Roman planted the sword in the stone had to be a baby and could not possibly remember the deed. Pelenor said this whole thing could have been avoided if Uther had a son. His daughter Morgana, dabbler in the mystical arts though she may be, hardly qualified. Then everyone grew quiet while the Bishop Dubricius said a short prayer for guidance and wisdom. Dubricius stepped back to where he got surrounded by some twenty monks and clerics. 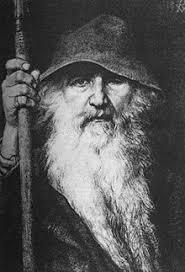 Meryddin stood on the other side of the yard with a dozen Druids to back him up. This was a land where the new had come, but the old seemed far from gone. Pelenor acknowledged that when he stepped up to the stone and addressed the crowd.